Lucas di Grassi, won the Drivers' Championship. Sébastien Buemi finished second in the drivers standings, 24 points behind Lucas di Grassi. Felix Rosenqvist finished the championship in third place in his first season in Formula E.
The 2016–17 Formula E season was the third season of Fédération Internationale de l'Automobile (FIA) Formula E motor racing. It featured the 2016–17 FIA Formula E Championship, a motor racing championship for open-wheel electric racing cars, recognised by FIA, the sport's governing body, as the highest class of competition for electrically powered vehicles. 25 drivers representing 10 teams contested 12 ePrix, starting in Hong Kong on 8 October 2016 and ending in Montreal on 30 July 2017 as they competed for the Drivers' and Teams' Championships. Sébastien Buemi was the defending Drivers' Champion after securing his first title at the 2016 London ePrix. His team, Renault e.Dams, began the season as the defending Teams' Champion, having clinched its second consecutive accolade at the same event. The calendar featured eleven significant changes from the 2015–16 season. The first two were the introduction of the Hong Kong and Marrakesh races, with the latter taking the championship to its first African venue. The third was the return of the Monaco ePrix, held for the first time since the 2014–15 season. The fourth was the Berlin ePrix returning to Tempelhof Airport after the event was held along the Karl-Marx-Allee in 2016. The fifth was the New York City ePrix double header, which brought motor racing back to the city for the first since 1896. The sixth was the series' first visit to Canada for the season-closing Montreal ePrix. The final four changes saw the Long Beach and Punta del Este rounds discontinued due to financial issues, the London double header was cancelled because of opposition to it being held in a public park and the Beijing and Putrajaya were dropped for undisclosed reasons. There were two new teams: car manufacturer Jaguar returned to motor racing as a works team for the first time in 12 years, and Team Aguri was bought by public entity and venture capital firm China Media Capital and renamed Techeetah. ABT Schaeffler Audi Sport driver Lucas di Grassi secured his first Drivers' Championship in the season-closing race in Montreal. The runner-up was defending champion Buemi, 24 points behind, after missing the New York City races because of a World Endurance Championship commitment at the Nürburgring, and rookie driver Felix Rosenqvist of Mahindra was third, another 30 points adrift. Although neither of their drivers won the drivers' title, Renault e.Dams clinched their third consecutive Teams' Championship, ahead of ABT Schaeffler Audi Sport and Mahindra. Jaguar returned to motor racing after a 12-year absence in collaboration with Williams Grand Prix Engineering. Several team changes took place before the season began. 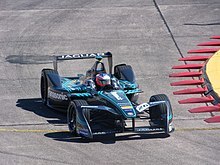 Car manufacturer Jaguar announced their return to motor racing in December 2015 as a works team for the first time since it withdrew from Formula One at the end of 2004. It entered the sport in collaboration with Williams Grand Prix Engineering, as a means of expanding their electric vehicle portfolio. Dragon Racing manufactured its own powertrain after using one supplied by Venturi in the previous season. It entered into a technical partnership with American start-up technology company Faraday Future in July 2016 for the next four seasons, with an option for a further four years after the current agreement expires. Likewise, shortly before the season commenced, Andretti announced a two-year technical partnership with BMW, enabling the German manufacturer to familiarise itself with the series in view of a potential works team for the 2018–19 season depending on Formula E's progress. After some uncertainty, Team Aguri principal Aguri Suzuki announced he was leaving the team in April 2016 as senior personnel entered "a period of consultation" over a future change in ownership. In the week before the 2016 London ePrix, the Chinese public equity and venture capital firm China Media Capital announced its purchase of Team Aguri and established a new entity to replace its existing structure. The entity was publicly named as Techeetah a few weeks later following Team Aguri's official withdrawal from Formula E. Senior personnel from Team Aguri, including team principal Mark Preston, retained their jobs with Techeetah, and the cars ran a custom Renault powertrain. After they were prevented from shipping vital car components for the season-opening race in Beijing, and failing pre-race scrutineering at the following round in Putrajaya, the Trulli GP team withdrew from Formula E, enabling Jaguar to enter the series. José María López joined the series with Virgin Racing, his first season in single-seaters since 2006. 2015 FIA Formula Three European Championship winner and two-time Macau Grand Prix victor Felix Rosenqvist joined the series with Mahindra to partner Nick Heidfeld, filling the seat taken previously by Bruno Senna, who elected to focus primarily on the World Endurance Championship in 2017. Defending FIA GT World Cup champion Maro Engel, who had not taken part in any single-seater racing series since the 2007 British Formula Three Championship, was hired by Venturi to replace World Endurance Championship driver Mike Conway, who left Formula E to focus primarily on endurance racing. Three-time World Touring Car champion José María López was employed by Virgin Racing to join its regular driver Sam Bird. López had previously competed in single-seater motor racing categories such as the GP2 Series with Super Nova Racing, along with occasional testing for the Renault Formula One team in 2006, and was signed to drive for the proposed USF1 project in 2010. Jean-Éric Vergne's future at Virgin Racing was under review since February and it was later confirmed to the press on 4 July that he left the team. He was signed to the new Techeetah team three days later. Vergne was joined by Ma Qinghua, who drove in the 2015–16 season's final three rounds. António Félix da Costa, who spent the previous two seasons with Team Aguri, confirmed in August that he had signed a contract to join the Andretti team. He replaced Simona de Silvestro who left the series to drive for Nissan Motorsport in the Australian Supercars Championship in 2017. Jaguar announced their drivers after the pre-season test session at Donington Park; a list of potential drivers circulated in the press. Four drivers were evaluated: 2008–09 A1 Grand Prix champion Adam Carroll, GP2 Series drivers Mitch Evans and Alex Lynn, and European Le Mans Series competitor Harry Tincknell to determine who would best fit their team. In September 2016, Jaguar nominated Carroll and Evans to drive for them with three-time Formula E starter Ho-Pin Tung their reserve driver. The season saw five driver changes. The first was the former Haas F1 driver Esteban Gutiérrez announced his entrance into Formula E in January 2017 having explored options with three teams before joining Techeetah. Gutiérrez replaced the poor-performing Ma who could not match teammate Vergne's form in the season's first three rounds, but he remained at Techeetah as its third driver. Duval and Engel did not participate in the Paris ePrix because of a Deutsche Tourenwagen Masters commitment at the EuroSpeedway Lausitz. They were replaced by Conway and Formula V8 3.5 Series champion Tom Dillmann respectively. Heading into the Berlin race, Stephane Sarrazin—who had raced for Venturi since the championship started in 2014—was granted permission to leave the team and joined Techeetah to replace Gutiérrez, who deputised for the injured Dale Coyne Racing driver Sébastien Bourdais in the IndyCar Series. His position at Venturi was taken over by Dillmann for the rest of the season. Because the New York City ePrix clashed with the 6 Hours of Nürburgring, López and Sébastien Buemi were required to prioritise the World Endurance Championship by Toyota. They were replaced by Lynn and 2016 GP2 Series champion and Super Formula driver Pierre Gasly. Formula E visited Marrakesh for the first time in the season, which marked the inaugural race on the African continent. The idea for a Hong Kong race first arose in 2013 when a design team visited the city. It was intended for inclusion in the 2014–15 season schedule, but negotiations and approval from local authorities, and motorsport's international governing body, the Fédération Internationale de l'Automobile (FIA), went longer than anticipated. In October 2015 the Hong Kong ePrix was announced by the CEO and founder of Formula E Alejandro Agag at a press conference at the Central Harbour Front Event Space pending further review by FIA. In February 2016, Stéphane Roux, the chief organiser of the World Touring Car Championship, announced to the local press that Formula E was "keen" to hold a race on the streets of Marrakesh in the "near future". Both races were confirmed in the final version of the calendar in a meeting of the FIA World Motor Sport Council in September 2016. After being left out of the 2015–16 calendar because it takes the place of the Historic Grand Prix of Monaco every other year, the Monaco ePrix was reinstated for the 2016–17 season with a scheduled date of 13 May to start a three-round streak in Europe. It had been proposed that the principality hold a race following the cancellation of the Moscow ePrix the previous season, but it did not proceed because of a lack of preparation time. In December 2016, Berlin city officials voted against the ePrix returning to the Karl-Marx-Allee, citing "unreasonable road closures and restrictions for residents and road users," prompting race organisers to find an alternative venue. Following consultation with city authorities, it was announced two months later that the Berlin ePrix would return to the venue that held the event's first edition in 2015, Templehof Airport, but on a revised layout. Formula E made its first appearance in New York City, the first motor race to be held in the city since 1896. In March 2014, it was announced that Formula E was working with New York City authorities to bring a motor race to the area. Formula E's founder Alejandro Agag told CNN in May 2016 that he was "very optimistic" about the possibility of hosting an event in the city: "I've just come from New York looking at different venues, different possibilities. It's far from done yet but we are very optimistic. Our dream would be to have a race in New York." On September 21, 2016, officials announced that the New York City ePrix would be held on the 1.210-mile (1.947 km) long Brooklyn Street Circuit in the neighbourhood of Red Hook, Brooklyn. Montreal's Mayor Denis Coderre announced in September 2014 that he had entered into advanced discussions with FIA's President Jean Todt over holding a race in the city. After flying to Miami to meet with series officials six months later, Coderre said in May 2015 that "informal agreements" had been reached, and planning for the event commenced in January 2016. A planned race in Brussels was removed from the calendar after local government officials could not agree on a suitable location to hold the ePrix. It was initially agreed that the race be held in the Heysel Plateau area north of the city, but the idea was dropped because of a clashing event. The series located a replacement venue 3 mi (4.8 km) south in Koekelberg but officials opposed this because of the disruption to early summer transport links. No other venue was found and the race was officially cancelled on 9 March, prompting the series to upgrade the Berlin ePrix to a double header. The Long Beach round was discontinued because a financial agreement to continue hosting the event was not reached, and the Punta del Este ePrix was dropped from the calendar owing to similar consequences with the Uruguayan government. The London ePrix double header was cancelled after a local community group brought a High Court challenge against Formula E because of its opposition to it occurring in Battersea Park. Furthermore, the Asian races in Beijing and Putrajaya were discontinued for undisclosed reasons. The start of the first practice session took place 15 minutes later to accommodate Roborace, the autonomous racing car series that held demonstration runs during the season. Unlike previous seasons, only one point was offered to the driver who recorded the fastest lap of any race to reduce the possibility that the championship would be decided by the additional award. A 50% increase in the available regeneration progress from 100 kW (130 hp) to 150 kW (200 hp) was made possible by the evolution of the Williams Advanced Engineering-constructed battery, expanding the amount of possible strategies to drivers. However, the maximum amount of usable power during the race weekend remained at 200 kW (270 hp) for season three. It was planned to increase the maximum amount of permitted power to 220 kW (300 hp) in season four and 250 kW (340 hp) in season five following extensive battery performance and cost analysis. Battery cell weight was increased from 200 kg (440 lb) to 230 kg (510 lb) though the car's maximum weight fell from 888 kg (1,958 lb) to 880 kg (1,940 lb). With regard to battery management, "power ramping down" was introduced whereby cars that exceeded their maximum power usage during the race were required to linearly ramp down to 0 kilowatts (0 hp) within five seconds on the track, and the car's rain light had to illuminate to alert other drivers. After the car crossed the line to mark the entry to pit lane, the driver had to engage the motor-generator unit to continue racing or return to the pit lane if this was unsuccessful. The change was introduced to aid spectators on energy usage rule transgressions without relying on a steward's decision. For the new season, tyre supplier Michelin introduced an upgraded version of its 18 in (460 mm) all-weather tyre, which provided less rolling resistance, a weight reduction, and was designed to supply better energy management. It was expected the tyres would gain optimum temperature faster and have the same high amount of longevity as the previous generation of tyres. The front wing mounted on all cars was redesigned for a more aggressive cosmetic appearance, and to give the series "a strong visual identity" to distinguish itself from other motor racing championships. Cars also ran with a redesigned steering wheel that provided drivers with additional functionality options to provide them with the new strategic choices made possible by battery modifications. Starting from the Berlin ePrix, teams were required to display a driver's name and racing number on the car's external bodywork for improved visual identification for spectators. Sébastien Buemi was the defending Drivers' Champion after securing his first title at the 2016 London ePrix. His team, Renault e.Dams, began the season as the defending Teams' Champion, having clinched their second consecutive accolade at the same event. Two pre-season test sessions, held at Donington Park, were conducted on 23 to 25 August and 5 to 7 September 2016. The test sessions saw quick times laid down throughout, and marked the first usage of Michelin's new tyre compound in both dry and wet weather conditions. Buemi and Vergne were the two fastest overall drivers on the third day of running although 1.5 seconds covered the field in terms of outright pace on a circuit almost twice the length of a standard ePrix track. Nelson Piquet Jr. (pictured in 2013) took pole position for the Hong Kong ePrix and led until lap 17 before crashing. The season began in Hong Kong. Qualifying was shortened due to multiple crashes causing several stoppages. The starting order was determined by the fastest drivers in the four qualifying groups. Nelson Piquet Jr. earned the first pole position of his career ahead of his teammate Oliver Turvey in second. He took an early lead from Turvey as the field was bottle-necked by contact in turns one and two. Di Grassi was caught off guard by Ma braking, and rammed into his car's rear, removing the right-front section of his nose cone. While Piquet pulled clear from the rest of the field, di Grassi was required to enter the pit lane for a replacement front wing and made his stop on the eighth lap. Bird had risen to second after passing Turvey two laps previously; he could not take the lead from Piquet until the latter reacted late to López's stricken car at the complex comprising turns three and four on lap 17, and went into the barrier. Piquet resumed by selecting reverse gear and emerged without any car damage, but the safety car was deployed to enable the extraction of López's car from the track and for marshals to repair the barrier. Some drivers elected to switch into their second cars at the end of the 20th lap. Having chosen not to make a pit stop, Bird led at the lap-21 restart and held it for an additional four laps until he made a problematic pit stop that lost him positions. As a result, Buemi moved into first place with di Grassi in second. Buemi was unchallenged for the remainder of the race and secured his first victory of the season and the seventh of his career. In the first Formula E race on the African continent, Rosenqvist clinched his maiden career pole position in his second race start and Mahindra's first. Buemi, who took second, was demoted five places on the starting grid because his car's fire extinguisher was found to be underweight because it had emptied from a possible leak. Rosenqvist took an early lead with making a fast getaway off the line. However, shortly after, he reported over the radio that his steering wheel's dashboard was only displaying one page, limiting the amount of information available to him. Rosenqvist had opened a five-second advantage over Bird, but the latter was caught by Vergne by more than four-tenths of a second per lap. Although he had less electrical energy, Vergne caught the delayed Bird, who chose not to protect, and overtook him for second on the 16th lap. On the same lap, the pit stops for the mandatory car change began when Rosenqvist and Vergne entered the pit lane, promoting Bird and Buemi into first and second. Buemi was faster than Bird and passed him on the following lap before both drivers made their pit stops. After the pit stops, Rosenqvist retook first place and retained most of his four-second advantage over Vergne. However, Vergne incurred a drive-through penalty for speeding in the pit lane and took it on lap 23, ending his chances of winning. Because he made a pit stop one lap earlier than the rest of the field, Rosenqvist slowed to conserve his electrical energy usage, allowing Buemi to draw closer at the rate of two seconds per lap with FanBoost aid. Buemi slipstreamed Rosenqvist and out-braked him to gain the lead on the 29th lap. Rosenqvist struggled to with his energy usage, and his slower pace allowed Bird to pass him for second with two laps to go. While Rosenqvist focused on preserving electrical energy, Buemi clinched his second consecutive win, and the eighth of his career. The championship resumed four months later in Buenos Aires. It was announced in November 2016 that the Buenos Aires race would be the last to be held at the Puerto Madero Street Circuit due to redevelopment in the Puerto Madero area. For the third consecutive race, the pole sitter secured his maiden first position start. This time di Grassi secured the accolade by nearly-two tenths of a second over Vergne. Di Grassi kept the lead at the beginning of the event, and Vergne held off Buemi for second place. Carroll remained stationary at his grid slot on the opening lap, but was able to start his car and racing resumed on the next lap. Vergne immediately began challenging for first and overtook di Grassi at turn four on the third lap to move into the lead. Buemi passed di Grassi three turns later to claim second place while Vergne established a small lead over Buemi. Buemi got a better exit leaving the final corner and out-braked Vergne for the lead three laps further on. Di Grassi struggled with his car's handling, enabling Turvey to pass him for third, and he was put under pressure by the other e.Dams car of Prost. The pit stop phase began on lap 18 and when it ended Buemi regained the lead. Six laps later, di Grassi returned to third by capitalising on a driving mistake by Prost. Di Grassi pushed hard in an attempt to close up to Vergne, but the French driver responded by stabilising the time deficit to two seconds. Although braking difficulties with his second car rendered him unable to brake in a straight line, Buemi won his third race of the season and the ninth of his career. He also became the first driver in Formula E history to win three consecutive ePrix. Oliver Turvey (pictured in 2013) took his maiden pole position in Mexico City and led laps before retiring with power problems. Prior to the race, Techeetah announced that former Haas F1 driver Esteban Gutiérrez would replace Ma Qinghua in the team's second car. For the first (and only) time in the season, the fastest driver in qualifying did not start from pole position. Daniel Abt set the fastest time, but a hefty grid penalty for tyre pressures that were below the minimum of 1.60-bar (160 kPa) left him 18th overall. Furthermore, second-place qualifier Maro Engel was demoted ten places because he changed his gearbox after two failures in the preceding round in Buenos Aires. This promoted Turvey to his first career pole position, and he made a clean start to retain his startline advantage on the first lap. As the field concertinaed through turns three and five, Engel hit di Grassi's car and damaged his rear wing. Di Grassi made an unscheduled pit stop for a replacement rear wing. The safety car was deployed on the second lap while marshals cleaned the track of debris and di Grassi avoided going a lap behind the leaders. Turvey kept the lead at the restart three laps later, and was closely followed by López until Turvey slowed with power issues, handing the lead to López. Turvey could not reset his car, leading to his retirement, and the safety car's second appearance. With the field closed up, di Grassi and Jérôme d'Ambrosio opted to make the mandatory switch to their second cars on the 18th lap. Although the change would enable the duo to gain positions when other drivers made their stops, it required them to conserve electrical energy towards the race's end. Di Grassi and d'Ambrosio moved into first and second places as a result of the field changing into their second cars between laps 24 and 26. The safety car was deployed after Loïc Duval stopped on the track with a battery issue. The safety car was withdrawn on lap 30 and di Grassi held the lead and conserved his electrical energy usage enough to make the finish, securing his first victory of the season and the fifth of his career. Di Grassi's win ended Renault e.Dams's streak of six consecutive victories, extending back to the 2016 Berlin ePrix. Elsewhere in an action-packed race, Buemi finished 14th after spinning attempting to overtake Rosenqvist, but he earned one point for setting the fastest lap. Di Grassi's victory brought with it twenty-five points that put him five points behind Buemi in the championship contest. The European leg of the season commenced in Monaco. The fifth consecutive driver to clinch pole position in the season came to fruition when Buemi recorded the fastest time in qualifying. He took an early lead with second-place starter di Grassi close behind. Buemi established a small advantage of one second over di Grassi. On the eighth lap, Bird drove over the kerbing at Tabac corner and damaged his suspension in an impact with a barrier. He was shown a black flag with an orange disc, requiring him to enter the pit lane for car repairs. His teammate López was mandated to do the same after officials noted damage to his rear wing. Both drivers began a battle to set the race's fastest lap. Piquet could not remain with the leaders and Vergne closed up to him. Vergne steered right onto the inside line on lap 21. As the two locked their tyres, Piquet clambered with his steering wheel, and the two made contact. Vergne's race ended prematurely at the wall, but Piquet continued driving. The safety car was deployed to enable Vergne's car to be extricated from the track, and drivers made pit stops for the compulsory switch into their second vehicles. Buemi led the field at the lap-26 restart, followed by di Grassi and Nick Heidfeld. After one lap under racing speeds, Buemi again pulled clear from di Grassi and established a one-second advantage over him. Buemi attempted to level out the electrical energy difference between himself and di Grassi by lifting and coasting and used FanBoost to maintain the lead. Di Grassi narrowed the gap to Buemi—who had less electrical energy available—to half a second with six laps remaining. While pondering an overtake on the e.Dams driver, slower traffic delayed them, causing di Grassi to drop back. Di Grassi was also awarded FanBoost, but he could not use it because of battery voltage limitations, although he drew closer to Buemi on the final lap. He forced the Swiss driver to defend his position, but could not find the space to get ahead as the run to the start/finish line was not long enough. It allowed Buemi to fend him off, for his fourth win of the season, and the tenth of his career. Sébastien Buemi won his fifth victory of the season in Paris to extend his Drivers' Championship advantage to a season-high of 43 points. Two drivers, Duval and Engel, missed the Paris ePrix because of a Deutsche Tourenwagen Masters commitment at the EuroSpeedway Lausitz and were replaced by Toyota World Endurance Championship driver Mike Conway and Formula V8 3.5 Series champion Tom Dillmann. In qualifying, where lap times were slower than in 2016 because of indistinct track surface changes and Michelin's new tyre, Buemi became the first driver to achieve his second pole position of the season with a slim gap of 0.006 seconds over López. At the start, Buemi fended off an overtake by Vergne to maintain his startline advantage. After the first lap passed without incident, the field established themselves and the first on-track battles commenced. Upfront, Buemi had a one-second lead over Vergne while Gutiérrez lost positions because he could not match the leaders pace. After passing Dillmann, Antonio Félix da Costa gained on di Grassi and overtook him, but the latter remained close behind Félix da Costa. Di Grassi attempted to retake the position from Félix da Costa on lap 16. He moved in front, but both cars made contact, causing them to spear into the wall. The stewards investigated the collision and no action was taken against di Grassi. The incident prompted the full course yellow procedure's activation. Most drivers, including Buemi, clambered into their second cars. Conway led for three laps before making his own stop. Vergne drew closer to Buemi on lap 34, but suspected something had broken on his car, causing his steering to become loose. He ran wide leaving turn 13, damaging his vehicle's front-right corner in a collision with the barrier, ending his race. Vergne's stricken car necessitated the safety car's deployment, and racing resumed four laps later with Buemi closely followed by López and Heidfeld. With two laps remaining, di Grassi locked his tyres and crashed into the wall, prompting the race to end behind the safety car for the second consecutive year. This enabled Buemi to clinch his fifth victory of the season and the 11th of his career. The result gave Buemi a season-high Drivers' Championship lead of 43 points. Rosenqvist secured his first career victory in the first Berlin ePrix but was penalised for an unsafe pit stop release in the second race. One week before the first Berlin ePrix, two more driver changes occurred when Gutiérrez left Techeetah to deputise for the injured Dale Coyne Racing driver Sébastien Bourdais in the IndyCar Series. Stéphane Sarrazin took his seat with Dillmann moving into the second Venturi car. Di Grassi—nursing an ankle injury he sustained in a charity football match four days prior to the first race— took his second pole position of the season with the closest margin in Formula E history, 0.001 seconds over López. Di Grassi took an early lead, while López made a slow getaway and was passed by the Mahindra cars of Heidfeld and Rosenqvist. By the start of lap five, di Grassi had a 1.2 second advantage over Rosenqvist and the latter required extra electrical energy in reserve to attack in the race's closing stages. Entering the pit stop window, Rosenqvist reduced di Grassi's lead to three-tenths of a second, and took advantage of di Grassi lifting and coasting early to take the lead on lap 22. After every driver switched into a second car, Rosenqvist remained the leader with di Grassi in second and holding back on using FanBoost for an attack on the latter. Heidfeld began to close up on di Grassi. Rosenqvist opened up a two-second advantage over the slower di Grassi and the latter activated FanBoost to defend from the closing Heidfeld. Rosenqvist held the lead for the rest of the race to secure his (and Mahindra's) first Formula E victory Elsewhere, Buemi recovered from a sub-par qualifying performance to finish fifth on the road. However, he was disqualified after the first race because all four tyres on both of his cars were below the minimum mandated pressure of 1.60-bar (160 kPa). Both Buemi and Renault e.Dams co-owner Alain Prost spoke of their disappointment with the decision, but chose to concentrate on the second race. Rosenqvist carried over his strong form into the second race with his second career pole position by nearly one-tenth of a second over Buemi. He maintained his pole position advantage on the first lap and opened up a two-second lead over Buemi. At this early stage of the race, Rosenqvist was instructed over the radio to preserve electrical energy by lifting and coasting. His teammate Heidfeld— who qualified 20th (and last) because a throttle sensor malfunction prevented him from recording a maximum power lap— caught Mitch Evans's Jaguar and challenged him for the final points-scoring position of tenth by the 13th lap. Upfront, Rosenqvist and Buemi pulled away from López and both were separated by a second. López was challenged by teammate Bird for third; the latter had difficulty overtaking until Bird executed a failed overtake four laps later that resulted in contact. Bird fell to seventh behind Vergne, di Grassi and Abt. At this stage, Buemi was 1.3 seconds adrift of Rosenqvist, but the latter was aware of the situation and glanced at his rear-view mirrors to ensure his advantage was large enough to remain ahead after the pit stops. The mandatory pit stop phase for the switch into a second car began on lap 23 when the leading drivers entered the pit lane. After driving out of his team's garage, Rosenqvist was released into teammate Heidfeld's path, causing the latter to swerve and nearly enter another team's pit lane gantry. Despite the delay, Rosenqvist remained the leader. He was immediately investigated by the stewards, and built up a steady advantage over Buemi as he was aware of the possible implications of his pit stop release. After reviewing Rosenqvist's pit stop release, he was handed a ten-second post-race time penalty. Rosenqvist was unhindered and he crossed the start/finish line after 46 laps to finish first on the road, 2.9 seconds ahead of Buemi. With the application of his penalty, Buemi was declared the winner, his sixth of the season and the 12th of his career. Sam Bird, pictured (right), won both New York City races. Buemi and López missed the New York City ePrix since the race clashed with the 6 Hours of Nürburgring. They were replaced by 2016 GP2 Series champion and Super Formula driver Pierre Gasly and GP2 Series driver Alex Lynn. In the first motor race held in New York City since 1896, Lynn clinched pole position in his maiden ePrix ahead of Abt. Wheelspin from Lynn leaving the grid at the start enabled Abt to move into first place. However, he could not pull away from the field because he opted to conserve electrical energy. Bird grew frustrated with his teammate Lynn defending and was eventually granted permission to overtake him for second on lap nine and quickly challenged Abt for the lead. Meanwhile, Abt had brake trouble and his team requested he focus on restoring electrical energy. Bird used this handicap to his advantage, and after twice failing to pass him, overtook Abt with an aggressive manoeuvre for the lead on lap 16. However, electrical energy management issues swiftly demoted Lynn from second to fifth by lap 17. By this point, Heidfeld attacked Abt, but Vergne drew closer to him; both demoted Abt to fourth. Abt regained the lead temporarily for one lap when the field made pit stops, but Bird reclaimed the position with Vergne now in second. Swift work from Sarrazin's crew enabled him to gain the most places and move into fourth while Heidfeld fell to eighth. Di Grassi battled Rosenqvist, but he drove cautiously in his attempt to find space for a pass. He moved ahead of Rosenqvist when the latter spun into a barrier on lap 33 and was required by officials to make a pit stop for repairs to his rear. Heidfeld's right-rear suspension collapsed from heavy contact with a kerb and stopped on the track on the 37th lap, necessitating the safety car's deployment. This prompted a two-lap sprint to the finish from lap 42 with Bird leading. Sarrazin took over third when Abt slowed with a battery management system failure on the final lap; Abt narrowly avoided collecting his teammate di Grassi as he endeavoured to rejoin the race. Vergne attempted to pass Bird by out-braking him, but he was not close enough to affect an overtake. Bird held the lead to claim his fourth career victory and become the first driver to win a motor race in New York City. The car of Pierre Gasly in the paddock prior to Sunday qualifying. He replaced Buemi who had a World Endurance Championship commitment. Bird carried his winning form from the previous day's race to clinch pole position with a 0.037 second margin over Rosenqvist. Drivers ran six more laps in the second race, making battery management the primary concern. For the second consecutive ePrix, it was not the pole sitter who led as Rosenqvist accelerated faster than Bird off the line to lead the first lap. Bird kept within reach of Rosenqvist in the opening laps, while Heidfeld gained on both drivers. The first full course yellow was prompted on lap nine when Evans hit the barrier near the entry to the pit lane and had difficulty reversing. Fourth-place runner Gasly was the first driver to notice the full course yellow's deployment and fell back from the leaders. Shortly after the restart, Bird attacked Rosenqvist and caught the latter off guard to make a pass for the lead on lap 11. Bird began to pull away from the field. A second full course yellow was triggered nine laps later when Lynn stopped on the back straight with a technical problem, and this prompted several drivers to make pit stops. Bird opted to remain on track for one additional lap before making his stop, giving him more electrical energy than the drivers behind him. When racing resumed, Bird used the restart to increase his lead to three seconds over the Mahindras without overusing electrical energy. Mahindra located an energy readout issue on Rosenqvist's car, and the team prompted Heidfeld to overtake him for second on lap 36 to see whether he could draw closer to Bird and pass him. Rosenqvist fell behind quickly so that his problem could be solved in a calmer environment. This allowed Bird to extend his advantage by another second. Heidfeld allowed his teammate Rosenqvist to reclaim second on the 48th (and penultimate) lap. Although he had an oversteer in the race's final moments, Bird opened up a healthy advantage, crossing the start/finish line a lap later for his second consecutive victory of the season and the fifth of his career. Gasly caught the Rosenqvist and Heidfeld on the final lap, and all three drivers concertinaed through the final turn. While challenging Heidfeld for third, Gasly carried too much speed entering the final corner, and drifted into a wall lining the track. He hurled a detachable barrier onto the circuit, which was no other driver collected. After the race weekend, di Grassi narrowed Buemi's championship lead to ten points heading into the season-closing Montreal ePrix. A maximum of 59 points were available for the final ePrix which meant Buemi could still win the title if di Grassi won both races and Buemi took two pole positions and finished second twice. A heavy shunt in the second practice session by Buemi prompted his team to construct a new car around a spare monocoque, but he was handed a ten-place grid penalty for changing his battery. Di Grassi clinched his third career pole position by going 0.196 seconds quicker than Buemi in qualifying, but the latter's penalty demoted him to 12th. When the race started, di Grassi fended off an attack from Sarrazin to lead the first lap. Buemi drove conservatively and was thus delayed in a tight pack of cars and sustained steering damage from contact with Robin Frijns. While di Grassi pulled away to establish a healthy lead, attention switched to Buemi who gained positions. On the 14th lap, Heidfeld attempted to pass Duval, but he defended his position and the two made contact. Duval continued driving, but Heidfeld sustained front-right suspension damage, and the full course yellow procedure was activated to allow his stricken car to be removed from the track. This prompted most of the field to enter the pit lane and switch into their second cars. Buemi was frustrated at Abt in the pit lane and Abt rammed into Buemi's rear. Swift work from Vergne's pit crew moved him to third. His teammate Sarrazin ceded second and Vergne began gaining on di Grassi. López lost control of his car's rear on lap 24, and spun into a barrier, necessitating the safety car's deployment. The safety car was withdrawn five laps later, and racing resumed with di Grassi using his FanBoost to pull clear from Vergne's Techeetah. Vergne drew close to di Grassi and was right behind him in the final two laps. He feigned an overtaking manoeuvre on di Grassi who defended the lead. Buemi closed up to third-place Sarrazin on the final lap, but he did not get ahead, as di Grassi maintained the lead to win. 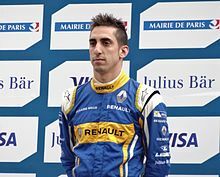 Buemi was visibly angry after the race and engaged in arguments with Félix da Costa, Frijns and Abt. He was later disqualified as his second car was found to be underweight. Renault e.Dams elected not to file an appeal. As a result, di Grassi displaced season-long championship leader Buemi and he held an 18-point advantage going into the season's final race. Jean-Éric Vergne (pictured in 2016) clinched his first motor racing victory in the second Montreal race since the 2011 Formula Renault 3.5 Series. In qualifying for the second Montreal race, Rosenqvist took his third pole position with Bird in second. Di Grassi took fifth while a driving error restricted Buemi to 13th. Rosenqvist kept his pole position advantage on the first lap. Sarrazin spun following contact with Piquet, and Abt and blocked the track at the first turn. Buemi's right-rear wheel guard flailed and detached from contact with Félix da Costa. He was shown a black flag with an orange disc, requiring him to enter the pit lane for repairs. The loose bodywork part fell off his car and his short pit stop lost him positions. After ten laps, Vergne mounted an attack on Rosenqvist for the lead as the former had more usable electrical energy than the Mahindra ahead of him. He could not find any space to move in front. The mandatory change for drivers to switch into their second cars began on lap 18 when Engel and Piquet became the first drivers to enter the pit lane. Rosenqvist followed on the next lap with Vergne, López and both ABT Schaeffler Audi Sport cars of di Grassi and Abt staying on track for an additional lap to allow all four drivers to run in clean air. Di Grassi's strategy of staying out for one extra lap did not work as his pit stop lasted two seconds longer than the agreed minimum pit stop time. He emerged in tenth, behind his teammate Abt. After the pit stops, Rosenqvist reclaimed the lead with a five-second advantage over Vergne. Vergne drew closer to race leader Rosenqvist on the 29th lap and took advantage of the latter lifting and coasting to overtake him for the lead. The improved top speed of Vergne enabled him to pull away quickly from Rosenqvist. López caught Rosenqvist in the race's final laps, but could not pass him. Vergne maintained the lead for the remainder of the race to clinch his maiden Formula E victory after securing eight podium results in the preceding three seasons. It was Vergne's first motor racing victory since the 2011 Formula Renault 3.5 Series round at Circuit Paul Ricard. Di Grassi advanced through the field to finish seventh and secured his first Drivers' Championship. Although Buemi finished 11th, and Prost took a solitary point for the fastest lap, Renault e.Dams retained the Teams' Championship for the third successive season. ^ Daniel Abt set the fastest time but was excluded for an illegal tyre pressure. ^ Felix Rosenqvist and Mahindra Racing were the initial winners but was given a 10-second time penalty for an unsafe pit stop release. † – Drivers did not finish the race, but were classified as they completed more than 90% of the race distance. ^ a b Elizade, Pablo (8 September 2016). "Jaguar Formula E team confirms Carroll, Evans during launch". motorsport.com. Archived from the original on 6 August 2017. Retrieved 3 August 2017. ^ a b c "Gutierrez to Techeetah". Current E. 9 March 2017. Archived from the original on 12 March 2017. Retrieved 22 March 2017. ^ a b c Smith, Topher (24 April 2017). "Dillmann to make race debut with Venturi". e-racing.net. Archived from the original on 24 May 2017. Retrieved 18 May 2017. ^ a b c Larkham, Lewis (19 April 2017). "Conway replaces Dvual for Paris". Current E. Archived from the original on 24 May 2017. Retrieved 18 May 2017. ^ a b c Mitchell, Scott (3 June 2016). "Sarrazin joins Techeetah in Formula E as Gutierrez goes to IndyCar". Autosport. Archived from the original on 26 June 2017. Retrieved 3 June 2017. ^ a b c Dupuis, Jacques-Armand (3 June 2017). "Fe – Tom Dillmann remplace Sarrazin chez Venturi". Auto Hebdo (in French). Archived from the original on 6 June 2017. Retrieved 3 June 2017. ^ a b c Smith, Sam; Klein, Jamie (10 July 2017). "Gasly confirmed as Buemi's New York ePrix replacement". motorsport.com. Archived from the original on 26 July 2017. Retrieved 12 July 2017. ^ a b Southwell, Hazel; Smith, Topher (26 June 2017). "Lynn called up for New York ePrix". e-racing.net. Archived from the original on 26 July 2017. Retrieved 6 July 2017. ^ Ruddick, Graham (15 December 2015). "Jaguar to join Formula E championship". The Guardian. Archived from the original on 3 June 2017. Retrieved 3 August 2017. ^ Smith, Sam (15 December 2015). "Exclusive: Dragon Racing to become Formula E manufacturer". motorsport.com. Archived from the original on 18 December 2015. Retrieved 15 December 2015. ^ Kelley, Seth (1 July 2016). "Faraday Future Partners With Dragon Racing for Formula E". Variety. Archived from the original on 12 November 2016. Retrieved 3 August 2017. ^ Biesbrouck, Tim (27 September 2016). "BMW confirms Formula E involvement with Andretti". Electric Autosport. Archived from the original on 2 October 2016. Retrieved 3 August 2017. ^ Smith, Luke (20 April 2016). "Aguri in takeover talks". Current E. Archived from the original on 22 July 2016. Retrieved 3 August 2017. ^ Klein, Jamie (28 June 2016). "Team Aguri concludes Chinese takeover deal". motorsport.com. Archived from the original on 2 July 2016. Retrieved 29 June 2016. ^ Kane, Mark (7 July 2016). "Formula E Accepts 10 Teams For Third Season 2016–17 And Adds 5 New Cities". Inside EVs. Archived from the original on 12 January 2017. Retrieved 3 August 2017. ^ Waring, Bethonie (27 July 2016). "Experience a focus for new kids on the block Techeetah". e-racing.net. Archived from the original on 1 October 2016. Retrieved 3 August 2017. ^ Mitchell, Scott (24 August 2016). "New Formula E outfit Techeetah to run Renault powertrain". Autosport. Archived from the original on 27 August 2016. Retrieved 3 August 2017. ^ O'Kane, Sean (15 December 2015). "Jaguar officially joins Formula E, and will make electric vehicles for the road". The Verge. Archived from the original on 24 October 2016. Retrieved 3 August 2017. ^ Smith, Luke (22 August 2016). "Rosenqvist joins Heidfeld at Mahindra". Current E. Archived from the original on 19 December 2016. Retrieved 17 December 2016. ^ Mitchell, Scott (8 August 2016). "Ex-DTM racer Maro Engel replaces Mike Conway in Venturi Formula E team". Autosport. Archived from the original on 11 August 2016. Retrieved 17 December 2016. ^ Smith, Sam (7 July 2016). "Lopez makes switch to Formula E with DS Virgin". motorsport.com. Archived from the original on 13 July 2016. Retrieved 3 August 2017. ^ Smith, Luke (4 July 2016). "Vergne to leave DS Virgin Racing for third Formula E season". NBC Sports. Archived from the original on 10 October 2016. Retrieved 6 August 2017. ^ "Vergne, Qinghau form Techeetah Formula E line-up". crash.net. 7 July 2016. Archived from the original on 10 July 2016. Retrieved 21 August 2016. ^ "Andretti Formula E signs Antonio Felix da Costa". Speedcafe. 11 August 2016. Archived from the original on 6 August 2017. Retrieved 3 August 2017. ^ Williams, Rebecca (16 November 2016). "Nissan has secured Swiss racer Simona De Silvestro for the next three SuperCars seasons". Herald Sun. Archived from the original on 1 December 2016. Retrieved 3 August 2017. ^ Aure, Francisco (28 July 2016). "Jaguar to confirm drivers after Donington test". e-racing.net. Archived from the original on 4 October 2016. Retrieved 3 August 2017. ^ Douglas, Scott (21 August 2016). "Jaguar narrow down potential drivers to four". The Checkered Flag. Archived from the original on 23 August 2016. Retrieved 3 August 2017. ^ "Formula E: Jaguar returns to racing with electric car". Wheels24. 9 September 2016. Archived from the original on 6 August 2017. Retrieved 3 August 2017. ^ a b c d e Smith, Luke (9 March 2017). "Berlin to host Formula E double-header in place of Brussels". NBC Sports. Archived from the original on 3 April 2017. Retrieved 3 August 2017. ^ Hilda, Noor Amylia (17 November 2016). "Exclusive: Track designer Nunes talks Hong Kong". e-racing.net. Archived from the original on 19 December 2016. Retrieved 17 November 2016. ^ "Hong Kong ePrix set to feature on season three calendar". FIA Formula E. 9 October 2015. Archived from the original on 11 October 2015. Retrieved 17 December 2016. ^ Calcuttawala, Zainab (29 February 2016). "WTCC Official: Formula E Seeks to Hold a Race in Marrakesh Circuit". Morocco World News. Archived from the original on 1 March 2016. Retrieved 17 December 2016. ^ Smith, Sam (28 September 2016). "Formula E calendar confirms New York clashes with WEC". motorsport.com. Archived from the original on 7 November 2016. Retrieved 2 December 2016. ^ Sylt, Christian; Hewitt, Kate (28 June 2015). "Formula E To Add Two New Races In 2016". Forbes. Archived from the original on 29 June 2015. Retrieved 9 May 2017. ^ "Date fixed for 2017 e-Prix". Monaco Life. 4 July 2016. Archived from the original on 17 May 2017. Retrieved 17 May 2017. ^ Bluhm, Tobias (22 January 2017). "No Berlin ePrix on Karl-Marx-Allee in 2017". Formula E Zone. Archived from the original on 27 January 2017. Retrieved 3 August 2017. ^ "Berlin ePrix reverts to Tempelhof Airport". FIA Formula E. 10 February 2017. Archived from the original on 18 July 2017. Retrieved 3 August 2017. ^ Sylt, Christian (March 28, 2014). "Formula E "Working With New York" On Street Race". Forbes. Archived from the original on April 1, 2014. Retrieved March 16, 2017. ^ Knight, Matthew (May 21, 2016). "Formula E: Agag 'very optimistic' on New York ePrix". CNN. Archived from the original on March 16, 2017. Retrieved March 16, 2017. ^ Mather, Victor (September 21, 2016). "An Event That Is Truly Electric: Formula E to Race in Brooklyn". The New York Times. Archived from the original on October 9, 2016. Retrieved July 16, 2017. ^ Bruemmer, René; Buchignani, Walter (28 May 2015). "Montreal in running to host electric race car Formula E season opener". Montreal Gazette. Archived from the original on 3 August 2017. Retrieved 13 July 2017. ^ Brousseau-Pouliot, Vincent (19 July 2017). "Formule E: la Ville achète pour 7,5 millions de murets neufs". La Presse (in French). Archived from the original on 19 July 2017. Retrieved 21 July 2017. ^ Mitchell, Scott (26 January 2017). "Brussels Formula E race on 2016/17 calendar depends on new venue". Autosport. Archived from the original on 2 February 2017. Retrieved 3 August 2017. ^ Lair, Keith (2 July 2016). "Formula E will not return to Long Beach Grand Prix in 2017". Press-Telegram. Archived from the original on 5 December 2017. Retrieved 5 December 2017. ^ Perilli, Andrea (4 December 2017). "Punta del Este 'likely to return' say local authorities". Just Electric. Archived from the original on 5 December 2017. Retrieved 5 December 2017. ^ Barker, Nathaniel (27 May 2016). "Final lap for Battersea Park Formula E as public opposition forces organisers to look elsewhere". South West Londoner. Archived from the original on 29 January 2018. Retrieved 19 March 2019. ^ Mitchell, Scott (2 July 2016). "Expanded Formula E 2016/17 calendar finally gets FIA approval". Autosport. Archived from the original on 14 April 2019. Retrieved 14 April 2019. ^ a b c d e "What's new for season three?". FIA Formula E. 9 September 2016. Archived from the original on 15 September 2016. Retrieved 3 August 2017. ^ a b c d e "FE – All that's new in Formula E". Fédération Internationale de l'Automobile. 7 October 2016. Archived from the original on 12 November 2016. Retrieved 3 August 2017. ^ Sala, Matteo (8 January 2016). "Formula E | Errore FIA, 250 kW solo nel 2018/19". FormulaPassion.it (in Italian). Archived from the original on 9 July 2017. Retrieved 3 August 2017. ^ "Power hike for 2016 regs". Current E. 6 January 2016. Archived from the original on 1 August 2017. Retrieved 3 August 2017. ^ "Formula E – Names and numbers on cars to become more visible". Fédération Internationale de l'Automobile. 1 June 2017. Archived from the original on 6 June 2017. Retrieved 4 August 2017. ^ "Buemi wins title after spectacular finale". FIA Formula E. 3 July 2016. Archived from the original on 6 July 2016. Retrieved 6 August 2017. ^ Mitchell, Scott (3 June 2016). "Formula E's summer 2016 Donington Park testing plan revealed". Autosport. Archived from the original on 3 September 2017. Retrieved 3 September 2017. ^ a b Smith, Luke (15 September 2016). "By numbers: September 2016 preseason test". Current E. Archived from the original on 24 October 2016. Retrieved 3 September 2016. ^ Byles, Sarah (25 August 2016). "Targets achieved for Mahindra Racing in opening Donington test". Mahindra Racing. Archived from the original on 28 October 2016. Retrieved 3 September 2017. ^ Smith, Sam (9 October 2016). "Hong Kong ePrix: Piquet heads NextEV 1–2 after Super Pole cancelled". motorsport.com. Archived from the original on 19 December 2016. Retrieved 18 December 2016. ^ Waring, Bethonie; Grzelak, Antonia (9 October 2016). "#NextEVolution successful: front row lockout with Piquet JR on pole". e-racing.net. Archived from the original on 19 December 2016. Retrieved 18 December 2016. ^ Kew, Matt (9 October 2016). "Formula E Hong Kong opener report: A new season, a familiar battle". eRacing Magazine. Archived from the original on 7 January 2017. Retrieved 18 December 2016. ^ a b Prior, Laura (9 October 2016). "Buemi Takes Victory in Inaugural Hong Kong ePrix". EV Performance. Archived from the original on 19 December 2016. Retrieved 17 November 2016. ^ a b c Smith, Luke (9 October 2016). "Buemi wins season opener". Current E. Archived from the original on 19 December 2016. Retrieved 17 December 2016. ^ a b Smith, Sam (9 October 2016). "Hong Kong ePrix: Buemi wins chaotic race, di Grassi second from 19th". motorsport.com. Archived from the original on 7 December 2016. Retrieved 18 December 2016. ^ Grzelak, Antonia (9 October 2016). "Hong Kong spectacle: Buemi wins and di Grassi conjures". e-racing.net. Archived from the original on 19 December 2016. Retrieved 17 December 2016. ^ Lumb, Tim (9 November 2016). "Formula E Marrakesh ePrix: Preview". MSN Sports. Archived from the original on 17 December 2016. Retrieved 2 December 2016. ^ Smith, Luke (12 November 2016). "Marrakesh Pole for Mahindra's Rosenqvist". Current E. Archived from the original on 17 December 2016. Retrieved 2 December 2016. ^ "Grid penalty for Buemi". Current E. 12 November 2016. Archived from the original on 17 December 2016. Retrieved 2 December 2016. ^ a b c d Smith, Sam (12 November 2016). "Marrakesh ePrix: Buemi fights back to take second win". motorsport.com. Archived from the original on 13 November 2016. Retrieved 15 December 2016. ^ a b c d Smith, Luke (12 November 2016). "Africa awards patient Buemi". Current E. Archived from the original on 17 December 2016. Retrieved 15 December 2016. ^ a b c Prior, Laura (12 November 2016). "Marrakesh ePrix: Sebastien Buemi Masterful in Morocco". EV Performance. Archived from the original on 12 December 2016. Retrieved 15 December 2016. ^ Rochette, Nina (12 November 2016). "Second victory for Buemi". FormulaRapida.net. Archived from the original on 17 February 2017. Retrieved 17 February 2017. ^ a b c d Thorn, Laurence; Grzelak, Antonia (12 November 2016). "Marrakesh mambo: Buemi dances around the competition". e-racing.net. Archived from the original on 17 December 2016. Retrieved 16 December 2016. ^ a b c Kew, Matt (12 November 2016). "Brilliant Buemi masters Marrakesh". eRacing Magazine. Archived from the original on 25 March 2017. Retrieved 15 December 2016. ^ Waring, Bethonie; Aure, Francisco; Perilli, Andrea (2 November 2016). "New Buenos Aires Circuit from season 4". e-racing.net. Archived from the original on 11 March 2017. Retrieved 14 February 2017. ^ Hall, Sam (18 February 2017). "Di Grassi secures Formula E pole in Buenos Aires". Autoweek. Archived from the original on 28 February 2017. Retrieved 9 March 2017. ^ a b c Smith, Luke (18 February 2017). "Buemi victorious in Buenos Aires Argentina". Current E. Archived from the original on 22 February 2017. Retrieved 24 February 2017. ^ a b Stevens, Chris (18 February 2017). "Buemi makes Formula E history with hat-trick of wins". FormulaSpy.com. Archived from the original on 11 March 2017. Retrieved 10 March 2017. ^ a b Prior, Laura (19 February 2017). "Buenos Aires ePrix: Buemi Cruises to Hat-Trick of Wins". EV Performance. Archived from the original on 22 February 2017. Retrieved 24 February 2017. ^ "Buemi relieved to overcome brake complaint". GPUpdate. 19 February 2017. Archived from the original on 11 March 2017. Retrieved 10 March 2017. ^ Knight, Matthew (3 March 2017). "Formula E: Sebastien Buemi scores historic hat-trick of wins". CNN. Archived from the original on 21 February 2017. Retrieved 10 March 2017. ^ a b "Tyre-pressure fault costs Abt pole". Eurosport. 1 April 2017. Archived from the original on 5 April 2017. Retrieved 2 April 2017. ^ Giordmaina, Jack (1 April 2017). "Pre Race Penalties for Vergne and Guiterrez and Engel". Formula E Zone. Archived from the original on 3 April 2017. Retrieved 2 April 2017. ^ Prior, Laura (1 April 2017). "Mexico City ePrix: Turvey On Top in Eventful Qualifying". EV Performance. Archived from the original on 5 April 2017. Retrieved 2 April 2017. ^ a b c d e "Di Grassi takes fightback victory in Mexico Formula E thriller". crash.net. 1 April 2017. Archived from the original on 3 April 2017. Retrieved 2 April 2017. ^ a b c Prior, Laura (2 April 2017). "Mexico City ePrix: Di Grassi Wins in Mexican Masterclass". EV Performance. Archived from the original on 2 April 2017. Retrieved 2 April 2017. ^ Lumb, Tim (1 April 2017). "Di Grassi wins thrilling Mexico City ePrix". Read Motorsport. Archived from the original on 2 April 2017. Retrieved 3 April 2017. ^ a b Rochette, Nina (2 April 2017). "Di Grassi takes gamble and wins crazy Mexico e-Prix". FormulaRapida.net. Archived from the original on 5 April 2017. Retrieved 2 April 2017. ^ a b "Di Grassi produces masterpiece in Mexico". FIA Formula E. 1 April 2017. Archived from the original on 3 April 2017. Retrieved 3 April 2017. ^ Selic, Aleksandar (2 April 2017). "Formula E: Di Grassi triumphs in Mexico City". Snaplap. Archived from the original on 5 April 2017. Retrieved 3 April 2017. ^ "Di Grassi powers from last to first for Mexico win". Racer. 1 April 2017. Archived from the original on 3 April 2017. Retrieved 2 April 2017. ^ "Buemi rues 'big disappointment' in Mexico". GPUpdate. 2 April 2017. Archived from the original on 3 April 2017. Retrieved 3 April 2017. ^ Mitchell, Scott (13 May 2017). "Renault e.dams driver Sebastien Buemi fastest in Monaco practice sessions". Autosport. Archived from the original on 17 May 2017. Retrieved 16 May 2017. ^ a b c d e f Prior, Laura (14 May 2017). "Monaco ePrix: Buemi Cruises to Confident Victory". EV Performance. Archived from the original on 17 May 2017. Retrieved 17 May 2017. ^ a b c d e Rowles, Stuart (13 May 2017). "Buemi bounces back to win the Monaco ePrix". Read Motorsport. Archived from the original on 17 May 2017. Retrieved 17 May 2017. ^ a b Mitchell, Scott (13 May 2017). "Monaco ePrix: Buemi holds off di Grassi for season's fourth win". motorsport.com. Archived from the original on 17 May 2017. Retrieved 17 May 2017. ^ a b Moreno, Guillermo (13 May 2017). "Buemi wins Monaco ePrix after a tight end". FormulaRapida.net. Archived from the original on 17 May 2017. Retrieved 17 May 2017. ^ Stevens, Chris (15 May 2017). "Battery restrictions stopped di Grassi using FanBoost on Buemi". FormulaSpy.com. Archived from the original on 17 May 2017. Retrieved 17 May 2017. ^ Gittings, Paul (14 May 2017). "Monaco ePrix: Sebastien Buemi doubles up on famous street circuit". CNN. Archived from the original on 17 May 2017. Retrieved 17 May 2017. ^ Smith, Sam (20 May 2017). "Paris ePrix: Buemi denies Vergne pole by 0.006s". motorsport.com. Archived from the original on 24 May 2017. Retrieved 22 May 2017. ^ a b c Mitchell, Scott (20 May 2017). "Paris Formula E: Buemi wins again, Vergne and di Grassi both crash". Autosport. Archived from the original on 21 May 2017. Retrieved 24 May 2017. ^ a b c d e f Grzelak, Antonia (20 May 2017). "Buemi expnads championship lead in Paris style". e-racing.net. Archived from the original on 24 May 2017. Retrieved 22 May 2017. ^ a b c Moreno, Guillermo (20 May 2017). "Buemi wins in Paris and remains unbeatable". FormulaRapida.net. Archived from the original on 24 May 2017. Retrieved 22 May 2017. ^ Mitchell, Scott (20 May 2017). "Di Grassi slams da Costa after Paris crash". motorsport.com. Archived from the original on 24 May 2017. Retrieved 24 May 2017. ^ Mitchell, Scott (20 May 2017). "Suspected steering rack failure caused Vergne's Paris ePrix crash". Autosport. Archived from the original on 24 May 2017. Retrieved 24 May 2017. ^ Knight, Matthew (20 May 2017). "Formula E: Buemi victorious as di Grassi crashes down and out in Paris". CNN. Archived from the original on 24 May 2017. Retrieved 24 May 2017. ^ Smith, Sam (14 June 2017). "Di Grassi ruled out of Le Mans with ankle injury". motorsport.com. Archived from the original on 14 June 2017. Retrieved 19 June 2017. ^ Perilli, Andrea (10 June 2017). "di Grassi pips Lopez to pole in Berlin". e-racing.net. Archived from the original on 7 July 2017. Retrieved 19 June 2017. ^ Pinquet, Guillaume (10 June 2017). "ePrix de Formule E de Berlin: Course 1". Spirit Formula E. Archived from the original on 7 July 2017. Retrieved 26 June 2017. ^ a b c d Prior, Laura (10 June 2017). "Berlin ePrix: Rosenqvist Rockets to Maiden Victory". EV Performance. Archived from the original on 7 July 2017. Retrieved 26 June 2017. ^ a b Price, Trent (10 June 2017). "Rosenqvist takes win in Berlin". eRacing Magazine. Archived from the original on 7 July 2017. Retrieved 26 June 2017. ^ a b Knight, Matthew (11 June 2017). "Berlin ePrix: Rosenqvist charges to maiden Formula E win". CNN. Archived from the original on 7 July 2017. Retrieved 26 June 2017. ^ Mitchell, Scott (10 June 2017). 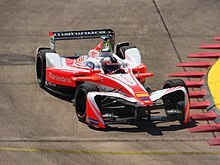 "Formula E Berlin: Felix Rosenqvist wins comfortably for Mahindra". Autosport. Archived from the original on 7 July 2017. Retrieved 26 June 2017. ^ Mitchell, Scott (10 June 2017). "Championship leader Buemi disqualified from Berlin Formula E opener". Autosport. Archived from the original on 7 July 2017. Retrieved 26 June 2017. ^ Smith, Topher (11 June 2017). "Rosenqvist surges to pole position for race two". e-racing.net. Archived from the original on 7 July 2017. Retrieved 26 June 2017. ^ a b Price, Trent (11 June 2017). "Buemi snatches aggregate win from Rosenqvist". eRacing Magazine. Archived from the original on 7 July 2017. Retrieved 26 June 2017. ^ a b Ruitenberg, Stefan (11 June 2017). "Felix catches Sunday Berlin pole". eRacing Magazine. Archived from the original on 7 July 2017. Retrieved 26 June 2017. ^ a b Prior, Laura (11 June 2017). "Berlin ePrix: Buemi Inherits Win as Rosenqvist Penalised". EV Performance. Archived from the original on 7 July 2017. Retrieved 26 June 2017. ^ Giordmaina, Jack (11 June 2017). "Normality Resumed as Buemi wins in Berlin". Formula E Zone. Archived from the original on 7 July 2017. Retrieved 27 June 2017. ^ a b DiZinno, Tony (11 June 2017). "Buemi inherits Berlin race two win after Rosenqvist penalty". NBC Sports. Archived from the original on 7 July 2017. Retrieved 28 June 2017. ^ Mitchell, Scott (11 June 2017). "Berlin Formula E: Buemi inherits win after Rosenqvist penalised". Autosport. Archived from the original on 17 June 2017. Retrieved 26 June 2017. ^ a b "Sébastien Buemi wins Formula E race in Berlin; Driver gifted win by pit stop confusion". Autoweek. 11 June 2017. Archived from the original on 14 June 2017. Retrieved 26 June 2017. ^ "Buemi wins race two of 2017 FIA Formula E Berlin ePrix". Xinhua News Agency. 11 June 2017. Archived from the original on 11 June 2017. Retrieved 28 June 2017. ^ "Formula E: Buemi wins in Berlin as Rosenqvist pays the penalty". CNN. 11 June 2017. Archived from the original on 28 June 2017. Retrieved 28 June 2017. ^ Weisinger, Jeff; Cameron, Christopher (12 July 2017). "Formula E racing rolls into Red Hook for city's first race since 1896". AM New York. Archived from the original on 26 July 2017. Retrieved 13 July 2017. ^ Smith, Luke (15 July 2017). "Alex Lynn takes New York Formula E pole on debut". NBC Sports. Archived from the original on 26 July 2017. Retrieved 17 July 2017. ^ Ruitenberg, Stefan (15 July 2017). "Sam Bird Win's inaugural New York ePrix". eRacing Magazine. Archived from the original on 26 July 2017. Retrieved 17 July 2017. ^ Giordmaina, Jack (15 July 2017). "Sam Bird wins the New York ePrix". Formula E Zone. Archived from the original on 26 July 2017. Retrieved 17 July 2017. ^ a b c d e Mitchell, Scott (15 July 2017). "New York Formula E: DS Virgin's Sam Bird takes first win of season". Autosport. Archived from the original on 26 July 2017. Retrieved 17 July 2017. ^ a b c Waring, Bethonie (15 July 2017). "Bird wins first ever New York ePrix". Read Motorsport. Archived from the original on 26 July 2017. Retrieved 17 July 2017. ^ a b Grzelak, Antonia (15 July 2017). "Big apple, big success: Bird flies to victory in New York City". e-racing.net. Archived from the original on 26 July 2017. Retrieved 17 July 2017. ^ a b Tamburrino, Romain (15 July 2017). "First victory of the season for Sam Bird in New York". FormulaRapida.net. Archived from the original on 26 July 2017. Retrieved 17 July 2017. ^ "Bird swoops to inaugural New York victory". Current E. July 15, 2017. Archived from the original on July 16, 2017. Retrieved July 17, 2017. ^ Southwell, Hazel (16 July 2017). "Bird surges to pole for second New York race". e-racing.net. Archived from the original on 26 July 2017. Retrieved 18 July 2017. ^ a b c d e f g Grzelak, Antonia (16 July 2017). "Double header – double win: Bird rules the streets of Brooklyn". e-racing.net. Archived from the original on 26 July 2017. Retrieved 18 July 2017. ^ a b c d e Mitchell, Scott (16 July 2017). "DS Virgin's Sam Bird doubles up with second New York ePrix victory". Autosport. Archived from the original on 26 July 2017. Retrieved 18 July 2017. ^ a b c d Quint, Ashley (16 July 2017). "Bird takes Formula E double in New York". Read Motorsport. Archived from the original on 26 July 2017. Retrieved 18 July 2017. ^ a b c d Price, Trent (16 July 2017). "Bird does the Double in New York". eRacing Magazine. Archived from the original on 26 July 2017. Retrieved 16 July 2017. ^ Stevens, Chris (16 July 2017). "Bird does the double in New York – Race Report". FormulaSpy.com. Archived from the original on 26 July 2017. Retrieved 18 July 2017. ^ a b c Pape, Timo (16 July 2017). "Formel E in New York: Sam Bird siegt auch am Sonntag, Heidfeld 3". e-formel.de (in German). Archived from the original on 26 July 2017. Retrieved 18 July 2017. ^ "Bird completes NYC FE sweep". Racer. 16 July 2017. Archived from the original on 17 July 2017. Retrieved 18 July 2017. ^ Clarkson, Natalie (17 July 2017). "Double win for DS Virgin Racing in New York". Virgin. Archived from the original on 26 July 2017. Retrieved 18 July 2017. ^ Fischer, Norman (27 July 2017). "Vorschau Montreal: Sebastien Buemi oder Lucas di Grassi?". motorsport-total.com (in German). Archived from the original on 3 August 2017. Retrieved 3 August 2017. ^ Smith, Sam (29 July 2017). "Montreal ePrix: Prost tops practice, huge shunt for Buemi". motorsport.com. Archived from the original on 3 August 2017. Retrieved 30 July 2017. ^ Aure, Francisco (29 July 2017). "Pole for di Grassi closes gap in championship". e-racing.net. Archived from the original on 3 August 2017. Retrieved 30 July 2017. ^ a b Stevens, Chris (29 July 2017). "Buemi expecting grid penalty as title rival di Grassi takes pole – Qualifying Report". FormulaSpy.com. Archived from the original on 6 August 2017. Retrieved 30 July 2017. ^ Bluhm, Tobias (29 July 2017). "Formel E in Montreal: Di Grassi siegt, Buemi rastet nach Rennen aus". e-formel.de (in German). Archived from the original on 3 August 2017. Retrieved 30 July 2017. ^ a b c "Lucas Di Grassi wins Formula E Montreal ePrix Race 1, points leader Sébastien Buemi disqualified". Autoweek. 29 July 2017. Archived from the original on 3 August 2017. Retrieved 30 July 2017. ^ a b c Grezlak, Antonia (29 July 2017). "The fast and the furious: di Grassi on top in Montreal". e-racing.net. Archived from the original on 3 August 2017. Retrieved 30 July 2017. ^ a b c d e Price, Trent (29 July 2017). "Di Grassi takes Montreal win as Buemi fights back". eRacing Magazine. Archived from the original on 3 August 2017. Retrieved 30 July 2017. ^ a b c Mitchell, Scott (29 July 2017). "Formula E Montreal: Di Grassi takes points lead with race win". Autosport. Archived from the original on 3 August 2017. Retrieved 30 July 2017. ^ Honeysett, Stuart (29 July 2017). "Formula E driver Sebastien Buemi fumes at three different rivals after wild championship race in Montreal". Nine's Wide World of Sports. Archived from the original on 3 August 2017. Retrieved 31 July 2017. ^ Smith, Luke (29 July 2017). "Buemi disqualified from Montreal Formula E opener". NBC Sports. Archived from the original on 3 August 2017. Retrieved 31 July 2017. ^ Smith, Luke (30 July 2017). "Rosenqvist on pole for Formula E title decider in Montreal". NBC Sports. Archived from the original on 3 August 2017. Retrieved 1 August 2017. ^ a b c d Grzelak, Antonia (30 July 2017). "At last: di Grassi crowned champion as Vergne wins". e-racing.net. Archived from the original on 3 August 2017. Retrieved 2 August 2017. ^ a b c Giordmaina, Jack (30 July 2017). "Di Grassi Champion as Vergne Wins". Formula E Zone. Archived from the original on 3 August 2017. Retrieved 2 August 2017. ^ a b "Vergne victorious, Di Grassi wins title". FIA Formula E. 30 July 2017. Archived from the original on 3 August 2017. Retrieved 2 August 2017. ^ a b Price, Trent (30 July 2017). "Di Grassi takes title as Vergne 'takes off'". eRacing Magazine. Archived from the original on 3 August 2017. Retrieved 2 August 2017. ^ a b c Mitchell, Scott (30 July 2017). "Di Grassi wins 2016/17 Formula E title, Vergne wins first race". Autosport. Archived from the original on 3 August 2017. Retrieved 2 August 2017. ^ Lumb, Tim (30 July 2017). "Vergne wins season finale, di Grassi crowned champion". Read Motorsport. Archived from the original on 3 August 2017. Retrieved 2 August 2017. ^ "More Montreal magic for JEV". Current E. 30 July 2017. Archived from the original on 3 August 2017. Retrieved 2 August 2017. ^ "FIA Formula E Championship 2017 standings". Driver Database. Retrieved 14 April 2019. ^ "Rules & Regulations". FIA Formula E. Archived from the original on 13 November 2016. Retrieved 2 December 2016. ^ a b "2016–2017 FIA Formula E Championship: Standings". Fédération Internationale de l'Automobile. Archived from the original on 3 August 2017. Retrieved 2 December 2016. Wikimedia Commons has media related to 2016–17 Formula E season.